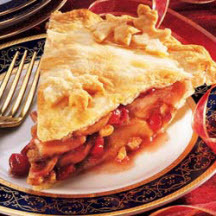 Add a splash of color and zing to apple pie with fresh cranberries — the flavor they add will remind you of tart cherries. Irresistibly delicious! Bake 50 minutes or until golden brown. Cover edges with foil if they begin to brown too quickly. Nutritional Information Per Serving (1/9 of recipe): Cal. 351 (17%DV), Fat Cal. 108, Pro 2g (3%DV), Carb. 63g (21%DV), Fat 12g (17%DV), Chol. 8mg (2%DV), Sod. 232mg (9%DV), Vit. A 4RE (0%DV), Vit. C 4mg (5%DV), Vit. E 0mg (0%DV), Calcium 24mg (2%DV), Iron 1mg (4%DV), Folate 2Ug (0%DV), Zinc 0mg (0%DV), Pot. 166mg (4%DV), Dietary Exchange: Fruit 2, Starch 2, Fat 2.